In this case, two children (ages 7 and 8) had their lemonade stand shut down by local police because they lacked a ‘Peddler’s Permit’, along with approval from the health department, and who knows how many other government permissions. Some politicians saw this story and decided to pass a law making it legal for children to operate lemonade stands. On one hand, great news. On the other, it’s pretty sad that a state legislature actually had to pass a law to make this legal. Amazon has been rolling out cashierless stores. You simply walk in to an “Amazon Go” store, scan the app, grab what you want off the shelf, and walk out. Cameras and sensors throughout the store charge you automatically for whatever you take. But you can’t use cash at the stores. And that has ruffled the feathers of one San Francisco politician who thinks that is discriminatory against people who cannot get credit or open bank accounts. She wants to force all stores to accept cash, and keep cashiers available to accept cash. Which sort of defeats the entire purpose of the cashierless business model… and adds back a bunch of unnecessary costs. But “They can afford it,” the politician says. The SWAT team breaking down his door, aiming guns at his family, separating him from his parents and placing him in the care of strangers? I’m going to have to say option B is worse for the child. But that is exactly what happened, all because his parents ignored a doctor’s advice to take their toddler with a fever to the emergency room. The doctor coordinated with the hospital, and when the family didn’t show up, called the Department of Child Safety. 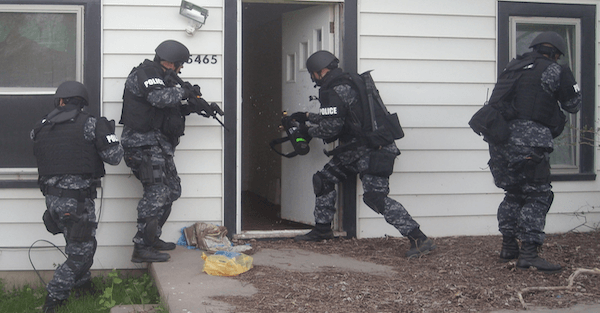 A few hours later, the SWAT team raided the home, and kidnapped the children. Now the parents have been separated from their children for a month, and could wait months more until they know if the state will allow them to have their children back. If your most basic parenting rights depend on the whims of the state, they’re no longer rights. A 78 year old veteran spent a year and a half in federal prison for the heinous crime of digging holes in his own backyard. The man lived in an area prone to forest fires, so he thought it would be a good idea to dig a few small ponds in his backyard. According to the EPA, his big mistake was digging in proximity to a “navigable waterway” on the edge of his property, a violation of the Clean Water Act. Not that anyone knows the first thing about countless vagaries of the Clean Water Act. But as they say, ignorance of the law is not an excuse. So the man was arrested, charged, convicted, and sentenced. He served his time and has unfortunately passed away. His widow has now asked the Supreme Court to review the case. I don’t seem to remember anyone from the EPA going to prison for spilling millions of gallons of toxic water into rivers in Colorado, New Mexico and Utah. In fact, the agency even refused to pay the $1.2 billion in damages demanded by affected farmers, homeowners, and rafting companies. So we’re definitely following this one closely. VPNs (Virtual Private Networks) are an important part of digital security and privacy; they provide a way to reroute your Internet traffic in a secure way to prevent hacking and monitoring by governments. People in places like China and Russia use VPNs all the time to beat Internet censorship. But now Russia is demanding that VPN companies comply with their censorship within 30 days, and help the government block certain websites. Many of the most popular VPNs say they will refuse to comply, and some have removed their servers from the country, taking them out of reach of Russian authorities. And that’s the great thing about the Internet: physical borders cannot stop the flow of information. Now it’s just an arms race to who can build the best technology: the censors or the censored.